The game of lacrosse originated with Native Americans, and descriptions of play were recorded by Jesuits dwelling in the Great Lakes region in the 17th century. Many tribes, playing as competitive teams across the U. S., engaged in some form of lacrosse, and three different game styles (the southeastern, Great Lakes, and Iroquoian) emerged. Among Native Americans, lacrosse was reserved for male players, and sometimes served as training for war due to the roughness of the sport. Today, the National Collegiate Athletic Association (NCAA) has a women’s division, and schools in both the U. S. and Canada routinely include a women’s lacrosse team in their sports programs. At the high school level, lacrosse is most popular in four Northeastern states (New York, New England, Pennsylvania, and Maryland). For years, lacrosse has been growing faster than any other sport in the country, from 253,931 players in 2001 to 624,593 in 2010. Your best chance at winning a college scholarship to play lacrosse is to distinguish yourself in high school play and make early contacts with college coaches. Remember, for lacrosse in Division One schools, over 200,000 players vie for perhaps 500 team positions each year. 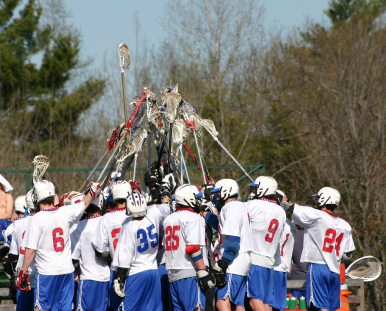 Sports camps and clinics can help you build your pre-college lacrosse resume. The Palo Verde Lacrosse Club has assembled some very helpful, and realistic, advice on obtaining college lacrosse scholarships in a downloadable format here. The NCAA divides these 174 awards evenly among the three seasons of sports it recognizes (fall, winter and spring) and then between genders, so that each gender receives 29 grants per season. The judges look for those who excel in academics as well as athletics, and eligibility requirements include a 3.2 GPA and nomination by a faculty athletics representative. Each scholarship is for $7,500, so there is much competition for these awards. The Texas High School Lacrosse League sponsors the annual Ray Maitland Memorial Scholarships, which offer three cash payments of $500.00 to high school seniors who intend to play lacrosse in college. You may contact the League directly for information on how to apply for a Maitland award. One boy and one girl who have participated in the Watertown Lacrosse League for at least two years will receive a cash scholarship of either $500 or $1,000. Applicants must have been accepted to a college or university and complete a community service requirement for the League. They must also submit three letters of recommendation and a letter outlining the need for financial aid, and maintain a GPA of at least 2.5. The Annapolis Youth Lacrosse Association (AYLA) offers the Willie Gateau Scholarship for $1,000 to a high school senior who has played with AYLA during at least one spring season. Although the scholarship is intended to defray college expenses, there is no requirement to play college lacrosse. You can obtain an application from your high school’s academic advisor and submit it with a resume, transcript, four letters of recommendation including one from your high school principal, and a typed essay with a photograph of yourself. US Lacrosse, the governing body for the sport of lacrosse in the U. S., hands out two Michael Breschi Scholarships to sons or daughters of a lacrosse coach who are graduating from high school. The scholarships are in the amount of $2,500 each, the parent must coach full-time at a high school or college, and other criteria for selection include community and volunteer service, extracurricular activities, and job experience. The New Jersey Lacrosse Foundation funds the NJ Bagataway “Spirit of the Game” Awards, which bring $1,000 each. One of the scholarships goes to a girl and one to a boy, and both must be high school seniors who play lacrosse and have demonstrated qualities like leadership, teamwork, and sportsmanship during their participation. Awards should help meet your college expenses. The Alfond Family Athletic Scholarships are awarded each year to one or more undergraduates who are members of the men’s lacrosse team. Applicants from New England receive preference. The Cassin Family Athletic Scholarship goes to a student who was recruited for men’s lacrosse and has entered the College of Arts and Sciences. The Thomas E. Curtis, Jr. Athletic Scholarship is given to undergraduate athletes, and women from New England who play on the lacrosse team are preferred. The John P. Esposito, Sr. Athletic Scholarship, like the Cassin scholarship, is awarded to a recruit in men’s lacrosse, but applicants must be enrolled in the McDonough Business School.